WordPress introduced a new content editor in version 5.0. 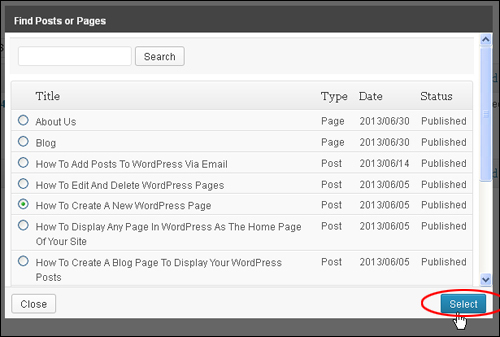 In WordPress, you can upload, store, and display a variety of file types (media) into your site’s content. The most common file types are images, videos, and audio files, but you can also use other file types such as PDF document files, spreadsheet files, code samples, etc. Typically, you will upload and add media into your content when creating or editing a post or page. 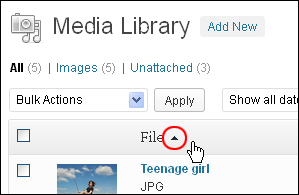 Adding media to the WordPress Media Library allows you to upload photos and create image galleries using an interface that makes uploading files and placing them into your posts and pages very easy. Additionally, you can create image galleries very quickly with drag and drop reordering, inline caption editing, and simplified controls for layout, among other things. 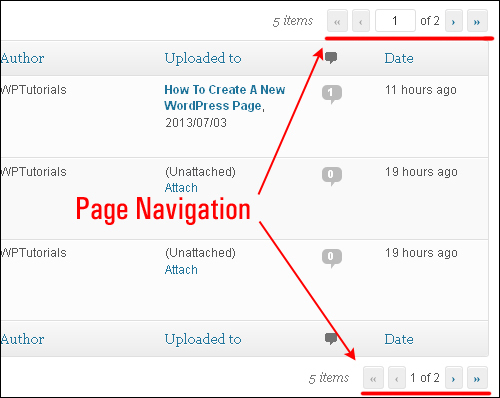 In this tutorial you are going to learn how to use the WordPress Media Library feature. Note: Some media settings such as specifying the size of thumbnail images and options for the location and structure of the media upload directory (where your media files are stored) are controlled in your WordPress Media Settings. 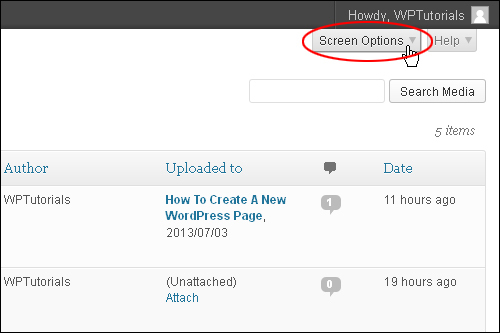 For security reasons, WordPress supports only certain types of files. 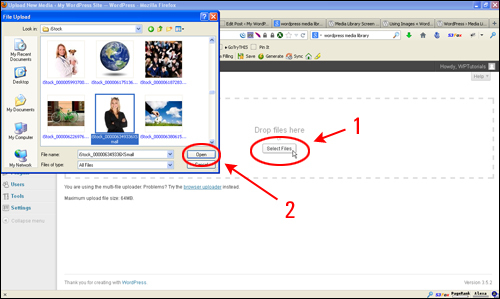 Some web hosts may not allow you to upload some of the file types listed above (and/or upload large files). 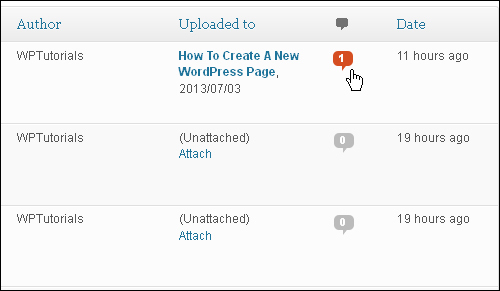 Check with your host if you experience issues uploading files to your WordPress site. 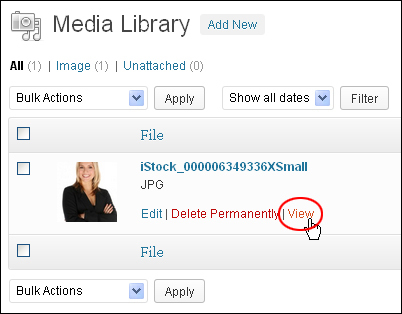 You can upload media files to your site without creating a post or page first. This allows you to upload files to use with posts and pages later and/or get a web link for a particular file that you can share. 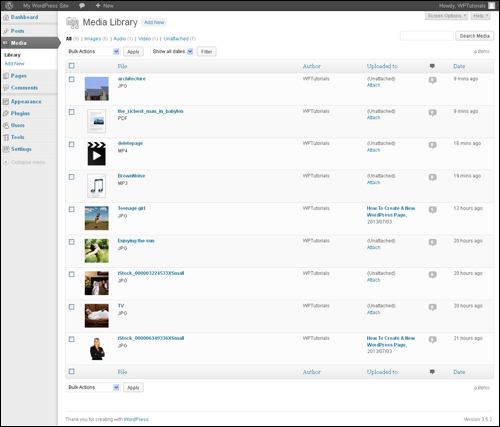 A table listing all of your media files will display in the Media Library screen. 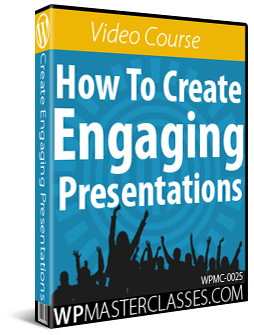 In a later section of this tutorial, we will cover all the features available in this section. 1) Drag-And-Drop: You can add multiple files to your Media Library by selecting a group of files and dragging them into the Drop files here area surrounded by the dashed border. 2) Select Files: This opens a window that lets you select a folder in your hard drive and upload files from your computer. 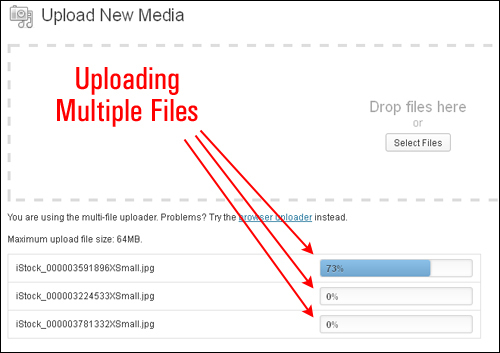 Note: the maximum upload size for your media files is determined by your web hosting account settings. In the example screenshot above, the Maximum upload file size is showing as 64MB (MegaBytes). Your screen may show a different maximum limit. 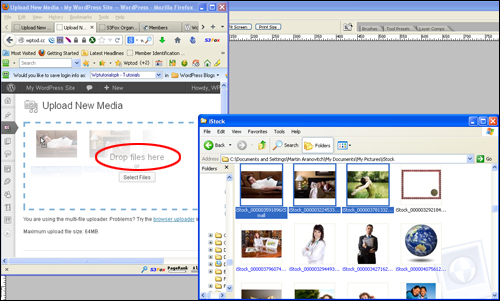 The drag-and-drop method is useful if you want to upload multiple media files located in the same source folder. However, you can also use it to upload a single image. Make sure that both the Upload New Media screen and the folder containing your image files are open and visible on your screen (you may have to resize their windows on your browser to see both of them at once). 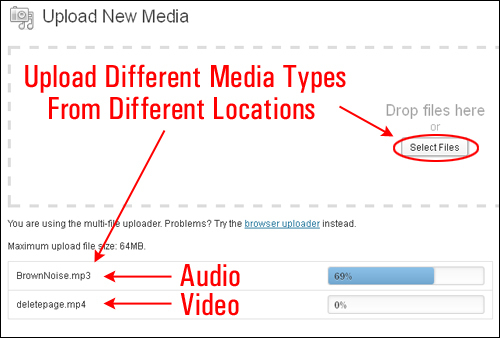 This method allows you to search for the location of your media files (e.g. in your hard drive), then upload one or multiple media files. 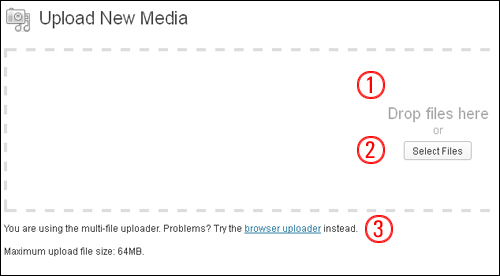 You can also use this method to upload different media file types (e.g. audio and video files) from different folder locations on your hard drive. If you experience any problems uploading your files using the previous methods, then try using the browser uploader instead. You can upload media that is not related to a Post or Page yet. 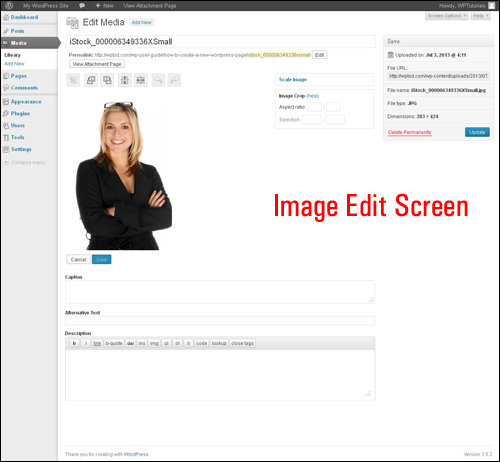 If a media file is uploaded within the edit screen of a post or page, it will automatically be attached to that post or page. Media items are also “Posts” in their own right and can be displayed as such. If the parent post of an attached media item is deleted, the media item will become attached to the deleted post’s parent if it exists. If no parent post exists, the media item will become unattached and available for re-attachment to another post or page. 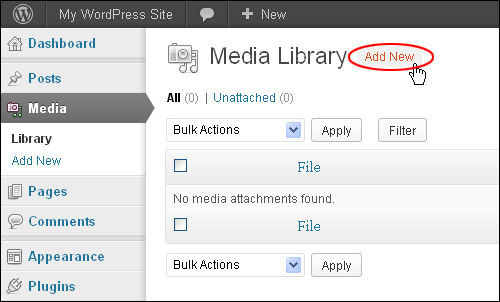 Once a media item is uploaded to the WordPress Media Library, it can be edited. See the Filtering Options section further below for instructions on how to delete multiple media files. [ ] – Check the box to select a media item. Selected items can be processed by a Bulk Action. Thumbnail – A thumbnail image of the media item is displayed in this column. Author – This column lists the user who uploaded the media item, or the file’s assigned author. Note: Files can be assigned a different author than the user who uploaded the file. 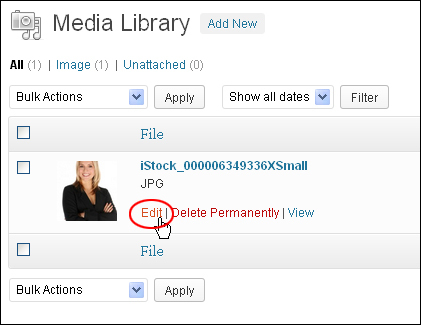 See this tutorial for details on how to change authors for media files. Uploaded to – This column displays whether a media file is unattached, or the Post or Page the file is attached to and the date of that Post or Page. Click on the title of the Post or Page to view that Post or Page in an edit Screen. If a media file is unattached, an “Attach” link will appear allowing the media file to be attached to selected Posts or Pages. Date – This column displays the time or date the media file was uploaded. 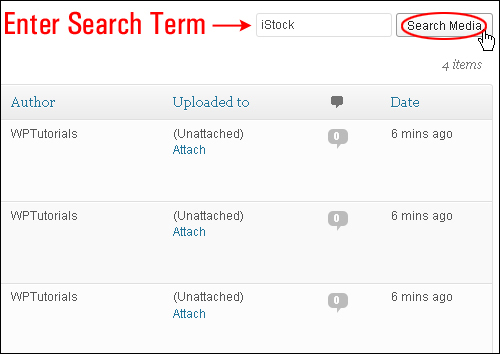 The column headings in the Table of Media can be clicked to sort media items in ascending or descending order. 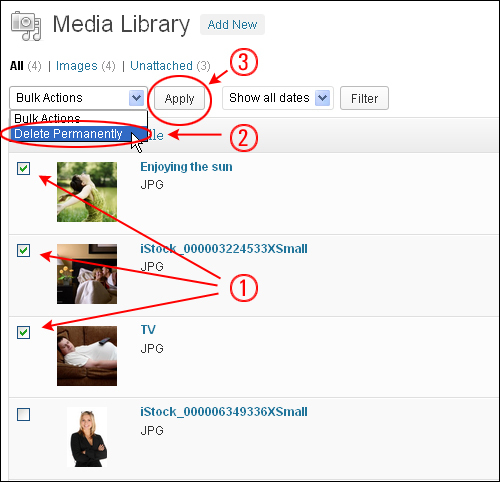 The number of Media items uploaded to your Media Library is displayed in the Table of Media, as well as the number of pages (if there is more than one page of media uploaded). 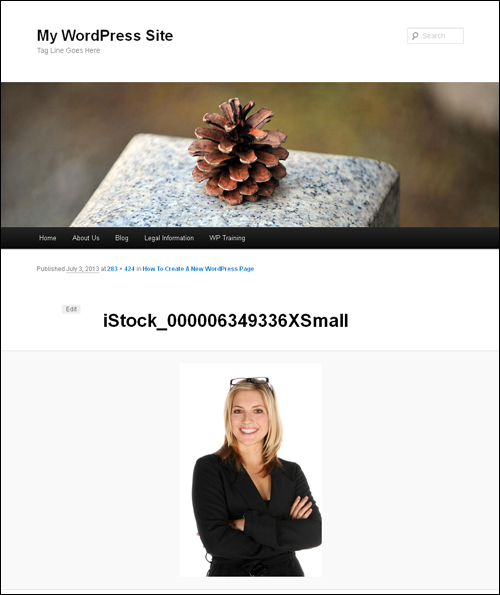 You can also specify the number of media items to display per page (see next section below). The Screen Options allow you to choose which columns are displayed, or not displayed, in the Table of Media. A list of columns is displayed with a check-box next to each column. Check the box for each column that you want to see displayed in the Table of Media, or uncheck the box to hide that column. Click the ‘Screen Options’ tab to close the Screen Options box. Bulk Actions Drop-Down Menu – You can perform Bulk Actions on one or more media files selected in the Table of Media. Currently, the only Bulk Action allowed for media files is to permanently delete all selected files. Show all Dates – This drop-down allows you to select which media files are displayed in the Table of Media by date. By default, “Show all dates” is selected and all of your media files are displayed. If you plan to use media frequently, there are a number of plugins you can add to your WordPress site to enhance your Media Library functionality and help you better manage and organize your uploaded media, like the one below. The Media Library Assistant plugin provides several enhancements for managing the WordPress Media Library, including shortcodes, templates, and integrations with other plugins and media formats. 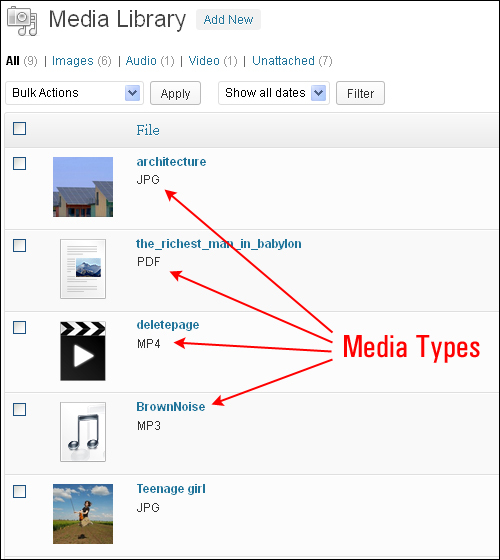 Media Library Plus enhances the functionality of the WordPress Media Library by allowing you to add and build new folders and sub folders to label and organize your media folders and perform operations on these folders and their contents, and provides you with a better way to manage image and video folders when creating WordPress image galleries and albums. Congratulations! 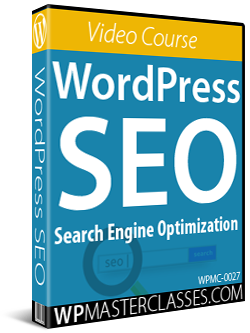 Now you know how to use the WordPress Media Library.